Kidz Zone. Architectural signs with whimsical shapes graphics and colors. Identify, regulate and direct with a twist of fun. Accent already stimulating environments while achieving the ultimate objective . . . identification. Youthful environments are designed to provoke thought, creativity and a sense of well being. Bright, soothing colors used in a medical setting provides comfort in an otherwise uncomfortable situation. 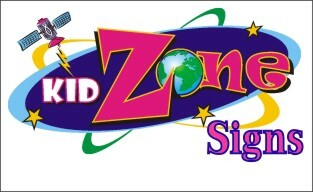 The Kidz Zone Sign Series achieves just that. With endless design and fabrication techniques, they can help to blend interior design shapes, colors and graphics into the design of the sign. Raised tactile images and grade II braille meet specific requirements enacted by Congress with the Americans with Disabilities Act (ADA), and enhance and add contrast to the appearance of the sign. Each sign is manufactured to exact specifications and adjusted to fit each particular application. Include facility graphics standards or company logo, and the sign takes on a new function, company identity. Incorporating changeable inserts into the design of the sign provides easy updates, should a room function or tenant change.